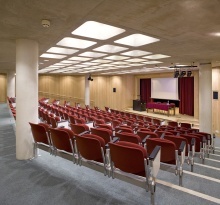 The McCrum Lecture Theatre is a College gem; tucked away on Bene’t’ Street and just hidden behind the Eagle Pub it offers conference organisers a 150 seated auditorium along with foyer space and in-built audio visual equipment. The auditorium has 150 comfortable, fixed tiered seats with fold away writing attachments. The stage has a surface area of 25sq m making it suitable for presentations and panel speakers. Viewings are encouraged, please contact the conference office to arrange a visit.